With Spring (finally) upon us, we are exploring ways that businesses and commercial districts can take advantage of the weather to attract shoppers, and to keep those shoppers on their corridors for longer. A parklet converts a small parking space (usually two parking space lengths) into a publicly accessible open space. 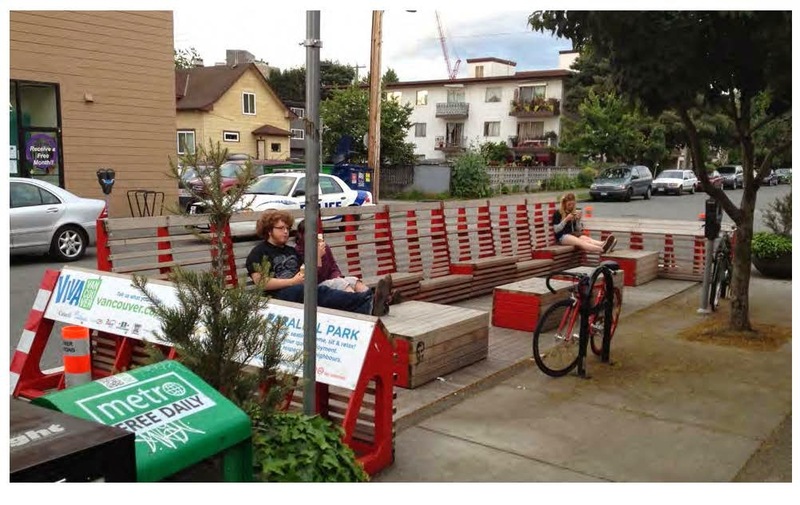 Parklets are generally built on a platform (of non-permanent materials) on the pavement, and feature elements such as seating, trees, flowers, shrubs, and bike racks to reflect the unique character of the space. They are designed, paid for, and maintained by a non-city entity (typically a business or property owner). 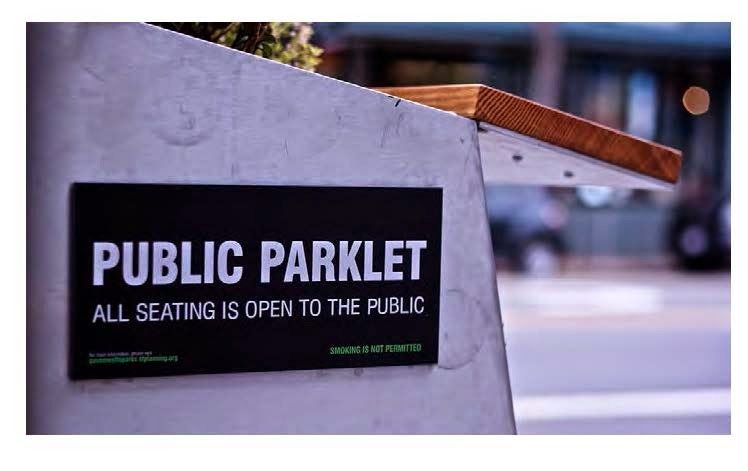 Many cities require signage to be located at either end of the parklet so that a passerby is aware it is an open public space. The “parklet” first emerged in San Francisco in 2005, when Rebar, a San Francisco art and design studio converted a single metered parking space into a temporary (two-hour) public park. Since then, cities across North America, including Montreal, Vancouver, New York City, and Philadelphia, have implemented parklets along their major commercial corridors. Parklets offer numerous benefits to pedestrians. They create spaces to sit, relax, and linger and they beautify the street by creating a buffer between the street and sidewalk. Studies also point to the benefits of parklets for businesses. In 2010, the non-profit organization Great Streets SF conducted a study of the Divisadero Street Parklet, located in front of the Mojo Bicycle Café in San Francisco, and found that the number of pedestrians increased by 13 percent, particularly on weekday evenings. 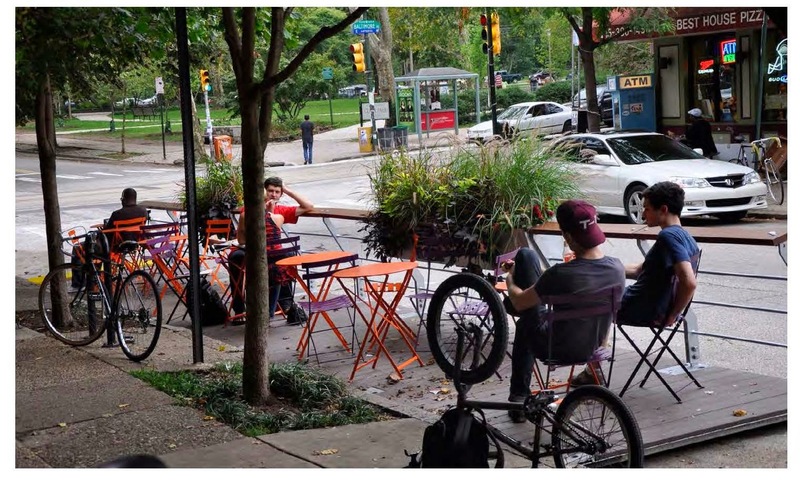 The study also found that many businesses have experienced revenue increases after the installation of a parklet, and in a few cases, created jobs as a result of increased demand. Do you have parklets in your commercial district? Tell us about them in the comments!